Hello and welcome to the wonderful world of Musical Ruth! and the amazing magical mobile piano. 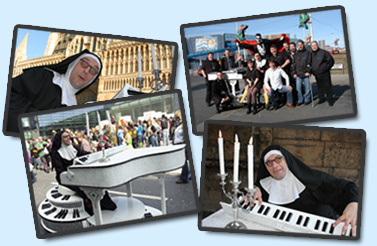 A world full of music, laughter and 100% Nunsense. The legendary Musical Ruth has performed all over the UK and Europe delivering a unique brand of humour coupled with unexpected renditions of traditional tunes and pop songs. Have a look at the lovely pics and videos and have all your questions and enquiries taken care of. Click here to see more videos of Musical Ruth! See pictures of the nun out and about at various events. WHAT'S THE NUN UP TO?? ?